In my early days with Sodexo, I spent days in frigid Northern Alberta analyzing costs at our largest North American project - Syncrude. If you have a bundle of determination, a study of your slowest day vs. your busiest day is a phenomenal exercise. Since I was specifically paid to improve profits at our Syncrude project, this is where I began. Slow Day/Busy Day requires taking four inventories in one week for every cost center. The time clock hours need to be available for each of the two days as well. You need to know every employee's job title and department. Calculate the total sales, labor cost, food cost, beverage cost, linen, paper, chemicals and other supplies. You won't be able to analyze electric power, water, telephone, sewage, garbage pickup, etc. Assume these costs are either fixed or 100% variable. I prefer to let these costs vary with sales. Start a spreadsheet with all of these sales and expense categories as the left column. Feel free to split labor into Management, Kitchen, Service and Office. Include an estimate for burden (employer's FICA, FUTA, SUTA, Health Care, 401K match, etc.) in your labor expenses. We always had our burden cost available for each project. Make a column called BUSY and another column called SLOW. Enter in all the data from your analysis. The next two columns are DIFF and VARIABLE. The values in the DIFF column are the difference between BUSY and SLOW. In the VARIABLE column express each value in the DIFF column as a percentage of the sales total in the DIFF column. The VARIABLE percentages are your variable costs as a percentage of sales. The final column is FIXED. The calculation is a bit trickier but still straight forward. Multiply the sales in BUSY by the percentage in VARIABLE and subtract the result from the BUSY value for the component. For example, if your busy day sales were $10,000 and the variable labor cost is 21%, the variable labor expense is $2,100 for the busy day. 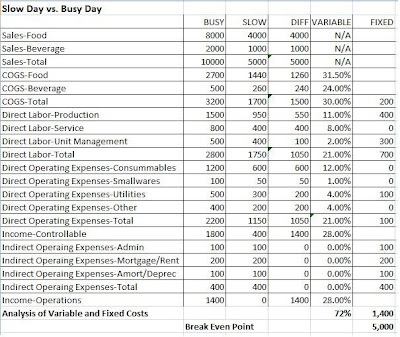 If the total labor cost for the busy day is $2,800, the FIXED value is $700. Go to the bottom of the table and sum the expenses in every column. A fantastic estimate of your break even point is now possible. Subtract the VARIABLE total from 1 and divide the total FIXED by the result. For example, if your VARIABLE total is 72% and the FIXED total is $1,400, your break even sales is $5,000 or about $1.8 million annual. The cost of performing this exercise is typically recovered promptly. Everyone in the operation will know you are serious about cost control. Remember, this requires four inventories of all consumables in one single week. Don't waste the effort with bad counts. I used to wake at dawn and return at close after midnight on the slow and busy days.